Home to many species of birds and animals, it is visited by more than 300,000 visitors a year. Itsmost famous local animal is the Cretan goat, also known as ibex or cri-cri. You can live a unique experience, going down the foot trail by walking 16 kilometers leading to the Libyan Sea coast, or follow the “lazy way” from Agia Roumeli, reachable from Sfakia by boat. 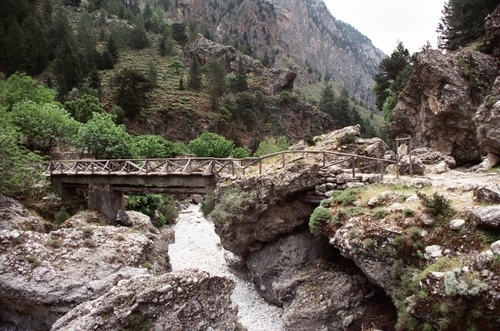 Walk 3 km up to “Gates”, the narrowest and most famous spot of the whole canyon. At “Gates”, lying a small distance from the landmark village settlement of Samaria, the gorge turns into an extremely narrow slit: if you stretch your arms, you can all but touch both sides of the cliffs towering vertically 350 meters above your head.